Monument Valley. Never been there; always wanted to visit. When I found out that Ultra Adventures was putting on a trail race there, I immediately began planning/training/trying not to get injured.
. . . because getting injured seems to be a sad pattern when I sign up for a “big race.” So I really really really tried to under-train and not over-do my mileage leading up to March 19, 2016. But it’s just so much fun to blast (at my 56-year-old-granny-snail speed) down hills here on my local trails; yep, I stressed my very sensitive (so sensitive I can’t let it watch the nightly news) left knee on a bugs-in-my-teeth-cause-I’m-smiling-so big run in February. Now that’s a positive attitude . . . and so for the first 18 miles I aimed for fun, taking it easy in the miles of soft sand, enjoying the company of such fabulous rock formations, mostly walking, jogging level spots, letting it go a bit more on the lovely sandy downhills . . . until that familiar stabbing pain in the middle of my knee-cap returned. Less intense than in the past, but still enough to keep mostly MOSTLY mostly walking the remaining 15 miles (total of 33.75 miles . . . or 55 kilometers). But I made it up to the top of Mitchell Mesa (where the above photo was taken) and got to soak in the huge views before plunging back down the insanely rocky trail (which my bare feet much preferred to the too-sticky stickers) and the final miles to the finish line . . . in about 10 hours and 42 minutes. My exact time? Unknown, since I lost the timing chip I was supposed to tie onto my shoelaces, only I didn’t have any shoelaces, so that was that. We didn’t trespass, but the race trails took us to otherwise-off-limits parts of this culturally important place. I’ve got a pair of sandals strapped to my back and Sockwa sock-shoes tucked in my waistband; neither were as comfortable as just. Plain. Barefoot.
. . . Until I encountered the dreaded stickers. Over and over. So I kept slipping the Sockwas on and off through stickery areas. The Mitchell Mesa “trail” winds its way up about 1,000 feet from the valley floor. Who doesn’t love ROCKS! The finish line: a demonstration hogan (traditional Navajo home) offered a vivid contrast to the special technology used to record racer times via the blue mats which were supposed to sense the computer chips we were supposed to have tied to our supposed shoelaces. But what about those of us sans shoelaces?! 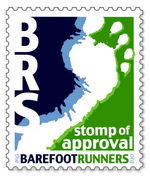 UPDATE: (April 7, 2016) The good folks at Ultra Adventures did add me to the results, even without a shoe chip. They are such an organized and friendly bunch . . . I highly recommend their races! AND . . . I just found out I won “judges choice” in their race photo* contest on Facebook . . . swag is headed my way . . . can’t wait! * The winning photo is the first one on this blog post . . . the view toward “The Mittens” over my toes from the top of Mitchell Mesa . . .
Gasp. Soooo beautiful. What a special event. Thanks for the report, Thea. Congrats for finishing!!! Such gorgeous pictures! And beautiful account. Thanks, Jane. I always use the “vivid” setting on my little pocket camera . . . it seems to capture my vision of this bright, beautiful world better than the “auto” setting. Congratulations! This is a very inspiring story. I just discovered using a heart rate monitor and it has slowed my “running” to excruciatingly slow, but the benefit is it has allowed me to feel free to keep going and do longer distances because it is so easy. (longer being very relative: 3 to 5 miles instead of 2 to 3) That means I get to explore more of the trails that my previous faster runs were just getting me to the edge of. How is your knee recovering after the race? Thanks, Scott. I’ve read about other runners doing the “MAF” thing with the heart rate monitor (especially Chris over at Barefoot Beginner http://www.barefootbeginner.com/2016/03/01/barefoot-running-log-march-16/). Thanks for checking in on my knee . . . it’s been unreliable since it first “acted up” in a 20-mile race 12 years ago . . . but I’m so thankful that only five days after the Monument Valley race I was able to run just fine, pain-free, up and down hills, back on my local trails. My goal is to not have to be concerned each time I run whether my knee will hurt or not, but in the meantime . . . each time I run (or walk) our local trails is a blessing. I can at least move, somehow! Happy happy happy trails . . .
Glad your knee recovered so quickly! That seems to say you are doing something right. I like your attitude about the blessing of getting to run your local trails. I hope to keep remembering that myself. Happy trails with mud puddles to splash in!